My place for all things nerdy, from every walk of life. A large chunk of theatre reviews, opinion and many other nerdy things. I once (ok several times) used the phrase "You don't grow up wanting to be Dana Scully and not become a feminist"
Wise words, if I do say so myself. But I also learnt so much more from Dana Scully. 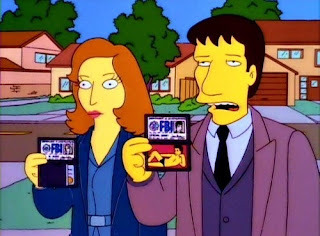 The X Files in general taught me so much about life-in that it was one of those formative experiences, I think you're really lucky if the thing that you're really into across your teens (and sometimes beyond) is something of substance you learn from, and that can stay with you. So much of what we're built to obsess over in those years is transient, tied to that time in the world or our lives. I got really lucky that the thing that was influencing me was so good that it still holds up. And that so many years later I'm seeing it come back to TV in a few short hours, thinking of all it did for me. The X Files inspired me to write, it gave me practice at it (I don't have to spell out how right?) it gave me analytical skills I use to this day, in breaking down and analysing episodes. It gave me my first experience of joining in with other fans online-and it still brings me friends that way today. It gave me something to obsess over in good and bad times. It led me to other tv, films and theatre that have all influenced my life. It took me to the thing (a play, starring Gillian Anderson) that would eventually shape my career and life choices. Scully taught me to be intelligent, and not to hide it. I did try and hide it at school. I'd change words in my writing so I wouldn't look like I was trying to 'show off'. I'd not put my hand up in case anyone thought I was being too clever, even though nobody else knew the asnwer. I knew being clever was a sure fire way to be made fun of. The cool kids have glasses and are at their computer. 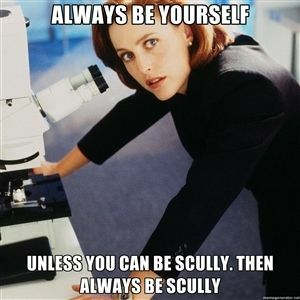 Scully says so. It's probably not too far a stretch to say that Dr Dana Scully played some part in my eventually getting my PhD. True I didn't end up a medical Doctor, mainly because my love of all things X Files led me to the creative root (see footnote). 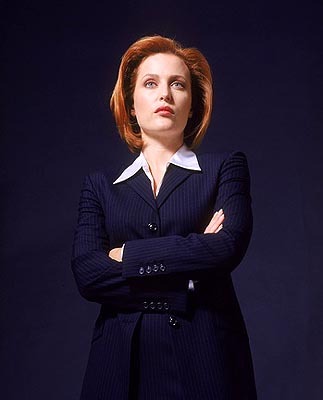 But the idea that it was an attainable thing, to be Dr whoever, really stemmed from Dana Scully in my world. I don't come from a background where people were Doctors of any kind. And while my path didn't take me to the sciences, I know that in the back of my mind, the seeds of those two letters in front of my name or three letters after it were sown by Scully. It's also why in part I have the presence of mind to stand up and say "It's Doctor actually" to those who call me 'Miss' in a derogatory manner. I learned that and the look that goes with it, from Dr Dana Scully. 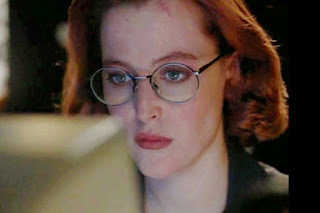 So (Dr) Dana Scully might have shown she was an intelligent force to be reckoned with, but that didn't mean she took the expected or prescribed path. Firstly not going into medical practise, but instead to the FBI because she thought she could 'make a difference' and then once in the FBI following what was really career suicide in staying loyal to Mulder and The X Files. Scully followed her instcints and her heart, doing what felt right, not what she should. This wasn't show as being without consequences, but she was also never painted as 'wrong' for doing so. I learned to always try and follow what I believed in from that. An important lesson in any young girl's life, Scully demonstrated this time and time again. It didn't matter if she was in a roomful of men, she was mostly listened to and if she wasn't there was hell to pay. 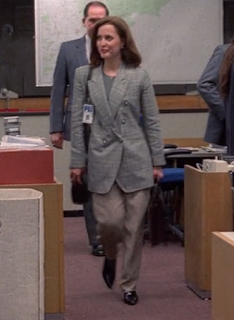 The same with Mulder, there was never any question that as a woman she was any less (early attempts of the higher up producers of the show aside) and she stood on equal ground (well on a box, Gillian is pretty damn short) with Mulder. And any other man who crossed her path. Dana Scully doesn't pretend to be anything less, hide her intelligence or her opinion for a man. And she doesn't change for any man. 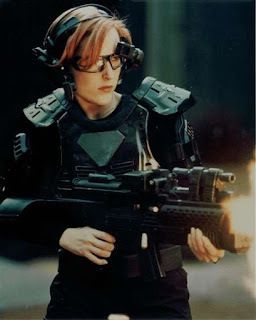 Short version: if Dana Scully didn't need a man to survive in life, then I didn't either. And that was the best news ever. This was me, all through University. And quite often since. In relationships you're equal. In relationships don't settle for anything less. Scully was always equal to Mulder. There was never any question, even in all the arguments they had-they were partners and equals. And as their relationship, ahem, developed, that was the foundations. I always joke that when you're teenage relationship idols are Mulder and Scully there is no hope. It's worse than being a hopeless romantic. When you realise at such a young age you need an intellectual equal who will go ten rounds of verbal sparring with you and still love you, well the bar is pretty high. What Scully also taught me was, intelligence, trust and a compatible mind was more valuable than anything else in a partner. I knew that instinctively from watching Mulder and Scully, and knowing Scully would never settle for anything else neither have I. Maybe to the detriment of variety and numbers in my dating life, but I still believe I'm better off for it. You have to find the right weirdo to dance off with. Your weirdo. Uncompromising to a fault. Whether it's standing in front of hearing after hearing, defending her work (sometimes literally at pain of death) or having a heated debate at a crime scene, or defending her faith, Scully stands up for what she believes in. I learned early on from her to speak up against injustice and speak out for what you believe in. Always go out fighting. Particularly if you have a super-awesome videogame gun to do it with. Even if she is the most gorgeous woman I've seen. I want to be her I want to marry her. It's very confusing. Dana Scully taught me how to dress, how to do my hair and how to do make up. I don't care that 90s FBI chic wasn't the best look on a teenage girl. That's not the point. The point being, I learnt about clothes and hair and make up because I wanted to look like her. Previously having no interest (and I'm not saying interest in these things is a must, each to their own) but having no older sisters, and not having that kind of friendship group, I learned those things for the first time. And it was important to me. I learned what suited me, what didn't, and the hair colour has become part of my personality. These last two points may seem trivial in comparison, hell maybe it all seems trivial. But it was a formative part of my growing up. 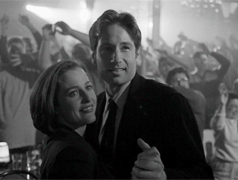 I've recently been re-watching all of The X Files, and I realise just how strong those influences continue to be. And that's the show itself, which artistically shaped me, taught me about challenging beliefs and educated me about all kinds of things (and all kinds of nonsense too) by the things it led me to. Well Scully, it's 22 years later, (16 years and half my lifetime since I discovered you) if I've managed to incorporate even a tiny bit of you into my life, I hope you'd be proud. You Could Drive a Person Crazy- or what is not your business. Come From Away: Memory, Memorial and Hope. 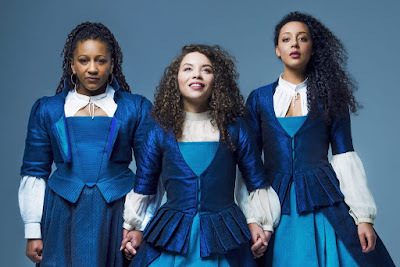 Known for being 'Dr Angels' or 'Dr Rent' for my PhD on Angels in America and Rent, I share my research, theatre reviews and other arts related thoughts here.